For whatever reason(s) the accomplishments, down to his face/stature, have been ignored like they never existed. Whoever came up with this mentality wants us to believe that after `Aloha from Hawaii` that Elvis either (a) ceased to exist (b) was a `cartoon` of himself (c) not relevant and/or (d) was not deserving of acknowledging ` remembering ` or respecting. I have one word for those lemmings and that word is`ENOUGH! I would prefer an Elvis Presley recording of 1977 (example is Elvis touching/beautiful rendition of `How Great Their Art` which he sang live on the `CBS Special` which aired after his death) versus ANY `performer` today. Somehow we are supposed to `forget` Elvis` weight gain, his struggles, his dreams, his body of work, his accomplishments, etc. during this time. Why? Up until the day he died Elvis sought answers to spiritual questions. Elvis helped people privately and publicly, Elvis sought out good songs (example is Dolly Parton`s `I Will Always Love You` which Colonel Parker tried to get Dolly Parton to give up a substantial share of her writing credit and monetary percentage and she said no. Elvis was not told this as Colonel, as Colonel did often, told Elvis a `half-truth` and it hurt him in many ways) and put his heart and soul into what he had to work with. 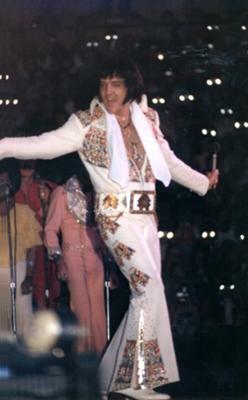 Some people hold onto the `dream` of `getting Elvis in 1977 to be like Elvis was in 1970″. Well, in 1970 Elvis was embracing one of the happiest times in his life. He was married, he was a loving Father, he had completed the movie contracts, Las Vegas wanted him and agreed to pay him the highest monetary amount ever paid to an entertainer, his vocal and stage performance skills were `off the charts` (i.e. his vocal range was incredible and he moved like a tiger and took the crowd on a ride bordering on love then frenzy and back again) and he had the highest rated TV show in what now is known as `The 68 Comeback`. Elvis in 1977 was dealing with the aftermath of his divorce, being away from his child that he adored, being on the `cycle` of touring over 100 days a year for five + years, his addition to prescribed medications, being over 40 years old and `matching` his mothers age of 42 when she died (note: Elvis Mother Gladys was really 46 years old when she died but Elvis believed she was 42 years of age), the monetary strains of bad management by Colonel Parker, the monetary strains of not maximizing his tax returns as Elvis was `scared to the core` about the IRS and he (basically) sent in his return and said `let me know if I owe you money`, his Fathers ill health, his relationship with Ginger Alden, and the book `Elvis What Happened`. For those who held on to the `dream` of Elvis returning to his appearance/energy/mentality of 1970 it was too high a bar and NO entertainer before, now, or hereafter will ever come close to achieving Elvis` performances. Then again what man, faced with real medical issues that adversely affect his ability to eat/sleep/go to the bathroom/move/etc., looks better at 42 than at 35? This is not to say that Elvis should not of sought medical help, and taken a well deserved year or two off from touring, but HE and HE ALONE was the `bread winner` for his family ` his relatives ` his loved ones ` his entourage — and many others. Elvis Presleys` efforts, to provide for his family and still give a good/great Concert, should be respected/appreciated/acknowledged and not `swept under the rug of musical history`. I cannot fathom the `mental adjustment` that Elvis had endured through 1977 when RCA put a `mobile recording truck` in the driveway of Graceland while Elvis recorded his last album (sadly) entitled `Moody Blue` versus the hype/endless possibilities/excitement starting in 1968 ` 1973. It is very telling that during that 1977 recording session that it was Elvis, and one member of the Memphis Mafia, and a few RCA Technicians. No applause, no `you can do it Elvis`, no sounding board, just Elvis alone with his voice reaching inside his soul to exchange his vocal cords onto vinyl closing his eyes and then opening them to the colors displayed inside of the Jungle Room. The inner strength that it must have taken on Elvis` soul, mind, spirit, body, etc. to be going through all of these `stresses` along with having his relationship with his daughter dictated by a `court proceeding` (note: Priscilla and Elvis had a very close relationship through 1977 and Elvis would call her late at night and talk for hours and show up at her home in the middle of the night and they put a `united front` to celebrate Holidays with Lisa so on this matter I say out loud to Priscilla a heartfelt `THANK YOU`) and waiving goodbye to the love of your life unsure of when, if ever, you will see them again. I know FIRSTHAND the pains, and the strength and toll, it takes on a man to not give into the mindset of `giving up` but to carry on every moment of everyday when it would be `easier` to just`stop caring. WHO could Elvis turn to, consistently, to share his inner fears? WHO could comfort him and tell him, so he believed it, that `everything will turn out allright`? Throughout Elvis` career it was always Elvis who solved the problem of others and was the `strong shoulder to cry on`. Far too many Elvis `fans` fed into the notion that, during the successful US Postal Campaign, there was the `skinny Elvis` (i.e. 1956) and the `fat Elvis` (i.e. 1973) when the facts were that Elvis lost over 25 pounds and was in very good (visually) shape for the `Aloha From Hawaii` Concert the first to use `Satellite` technology seen Worldwide by over a billion people. I would put Elvis physical appearance in 1973 against any other `Celebrity` who ever lived. Elvis was blessed with not just `good looks` but with `overwhelming good looks` and a trillion dollar smile/persona. Having spent the vast majority of my life collecting Elvis, reading about Elvis, watching Elvis, etc. I am, and always was, taken aback by the lack of respect that Elvis was given for going onstage ` giving of his time/efforts ` giving the fans a great show ` all the while feeling terrible and KNOWING you look `not your best`. It takes a REAL MAN to face that reality and give it their all.